I am obsessed with this tiny stove. We cannot express how happy and excited we are to start using the trailer this season! After spending last summer doing the bulk of the restoration (which we’ve been sharing with you retroactively), we only have a few more things to accomplish early this summer before she’ll be complete! Since she’s in storage on our family farm a few hours upstate, we didn’t get to see her over the long winter – but over Memorial Day weekend, we had the opportunity to pay her a visit. 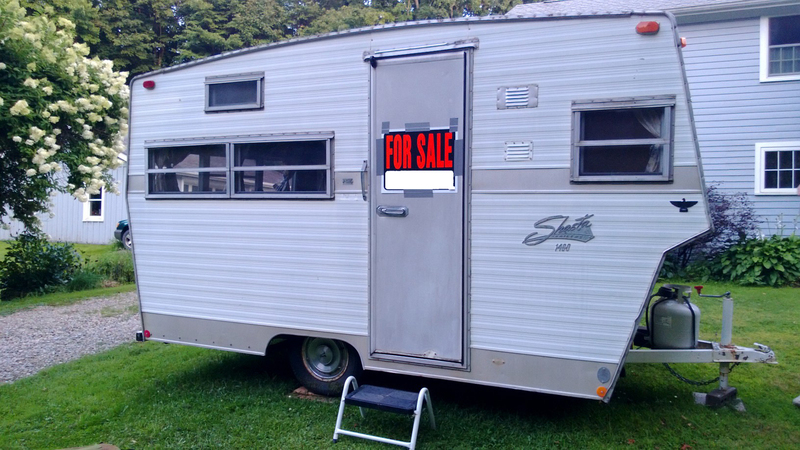 We’re happy to report that she looks better than we’d remembered, and we’re making plans to haul her out and camp in her in late June and throughout July and August. While we have an awning we only had two poles, which wasn’t working for us when we tried to set it up last year, so we ordered new poles and ropes from Marti’s Awnings (thanks Marti! We can’t wait!). We’ve got our kitchen stocked with fabulous retro melamine plates and cups, we’ve got our floral enamel pots and pans ready for our tiny oven, we’ve got our 1972 tea towels on display and we’re ready to roll! We can’t wait to do a proper photo shoot of the interior once she’s out in the sun. 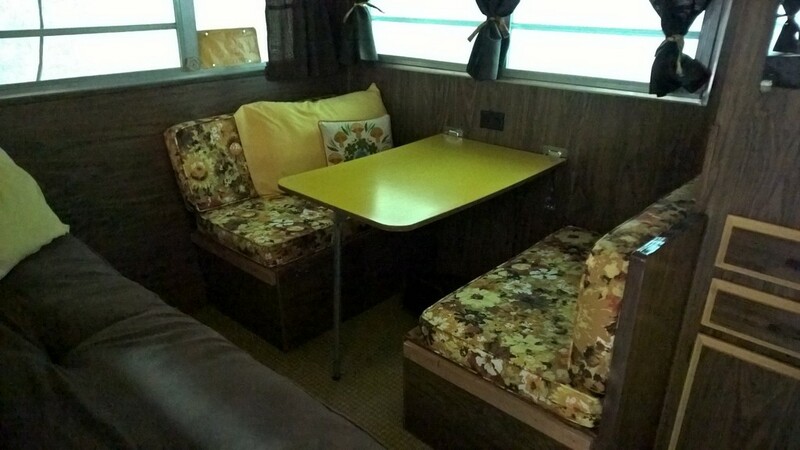 Our dinette is looking fabulous! We’ll keep telling the story of our restoration, along with adding updates about all the little things we have left to do – which is really just a little bit of wiring, and getting her painted! We’re so close! 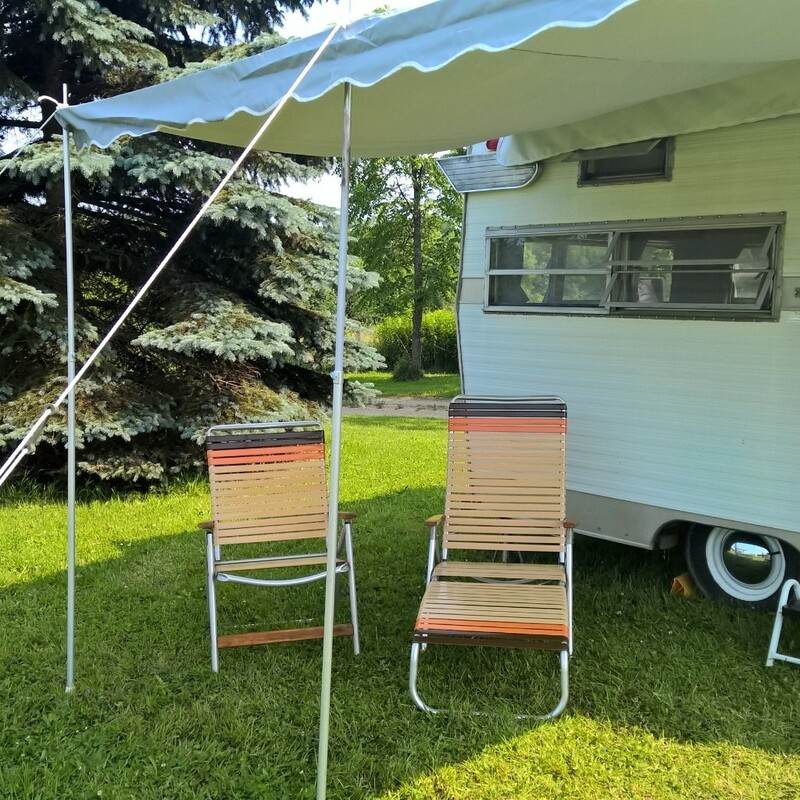 Here’s to summer fun – we hope all of you out there are enjoying your trailers, whether they’re still projects or they’re show-ready examples of vintage perfection! We’re still in between – but we’re definitely close to the finish line! The Shasta after our restoration. We’ll paint her in the spring to recreate the original gold and white finish. 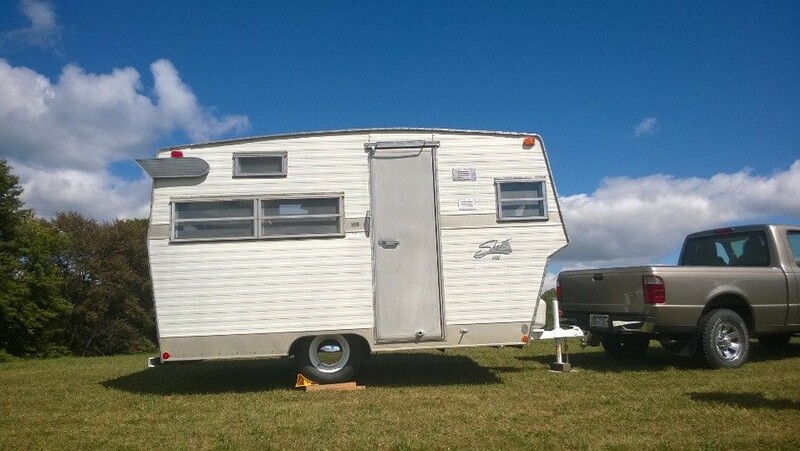 Our goal since we bought our Shasta last year was to have her repaired and weatherproofed so that we could sleep in her over this past Labor Day weekend, when our family has a huge camping reunion. Since we had a deadline, this summer we’ve spent ten hour days nearly every weekend, including lots of Fridays and Mondays, trying to finish in time. We didn’t update the blog as we were working as we’d planned, because we quickly found that when we weren’t working on the Shasta, we were trying to stop thinking about working on the Shasta! But we’re happy to report that we succeeded in finishing on time – we spent the past week sleeping in the Shasta, which was extremely satisfying after all the work we did on her. She’s not completely finished – we didn’t have time to paint the exterior, because as you’ll see we had some difficulties we hadn’t expected while we were doing the repairs. But we’re confident she’ll pass inspection, and her interior looks wonderful! We’ll finish our restorations in the spring – we won’t have an opportunity to do the paint job until then. We no longer have a sagging waterlogged roof and rotten boards – we removed and replaced about 30 pieces of the wooden frame, after finding, once we got the skin off, that the damage was worse than we’d hoped. We’ve got the original style lights back on her. The spare tire is mounted on the back, and we replaced the hubcaps and painted the rims. 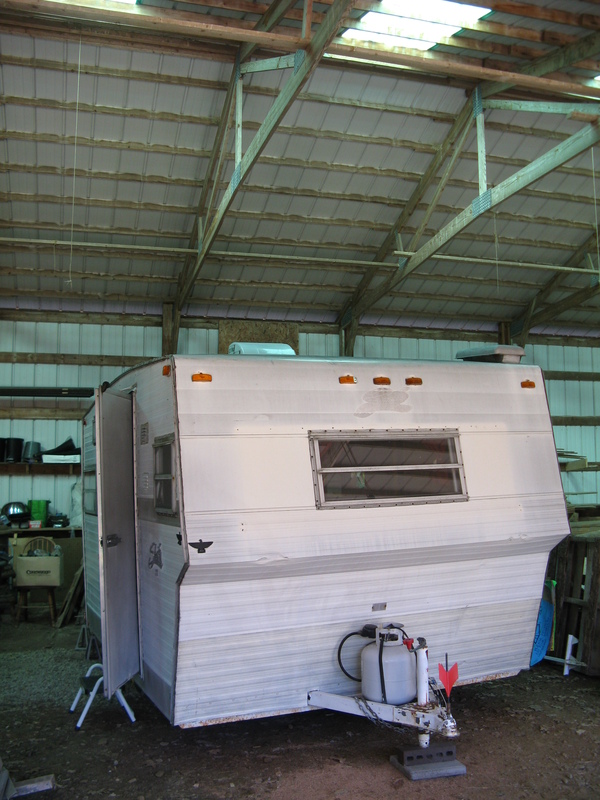 We put new aluminum screens in all the windows, replaced the central roof vent, and resealed the entire trailer. We even found her a beautiful pair of wings! Once we organize all of our documentation, we’ll post regular updates picking up where we left off a couple of months ago when we’d just removed the windows. Even with the internet to help us – not to mention the wonderful friends and family members that helped us when the internet failed – a lot of the repairs were accomplished through trial and error. We want to include all the tips and tricks we used to accomplish the restoration – so if you’re working on a similar project and have a question we might be able to help with, leave a comment. This was a very hard job, and we are pretty proud that we accomplished everything that we did. We’d like to thank everyone at the farm who spent time helping us with this project. We couldn’t have done it without you. Look for lots more pictures and details to come! A friend stopped and took this photo in Ohio the other day and I just had to share. 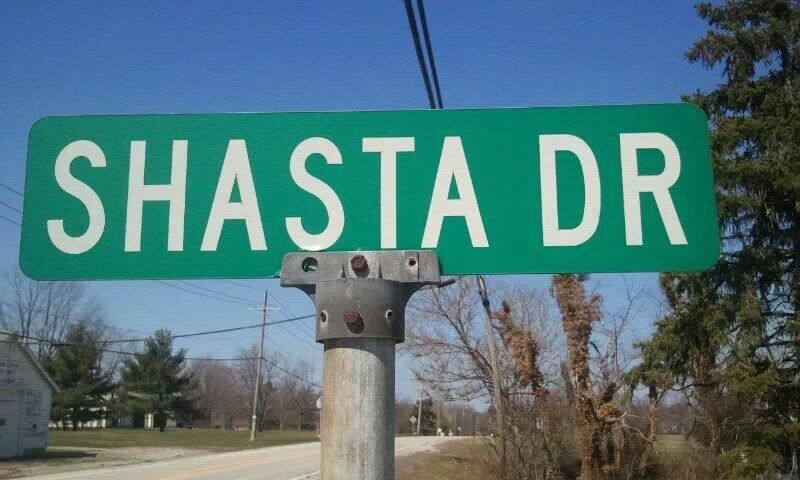 We are starting work in earnest this week. We’ve got all our supplies together, and we’re as ready as we’re ever going to be to take off our aluminum shell and see what we’re dealing with! We’ll post more updates next week! Wish us luck, fellow trailerites – we’re a little bit nervous but we know it can be done! We recently had some vacation time, and made it out to visit the Shasta and do a little bit of work. Here you can see her in the barn, and get an idea of how much room we’ll have once we start work on the roof! After the excitement of finding the Shasta, making a couple of trips to check her out (thanks to Josh the Mechanic for giving her the thumbs up! 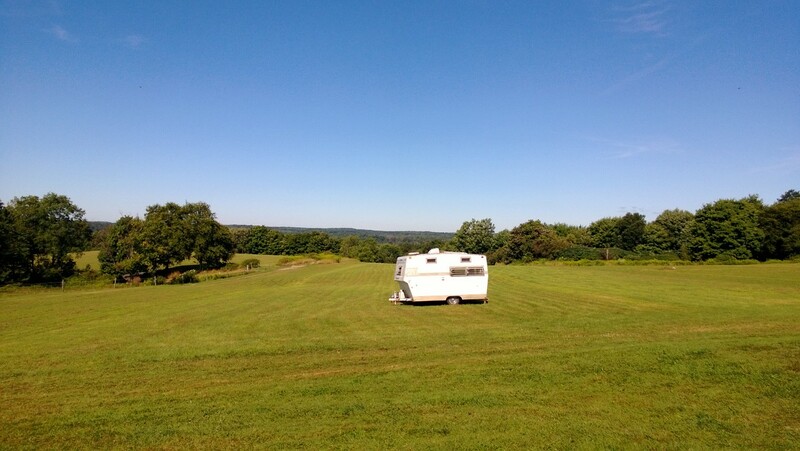 ), actually buying the thing and having her towed up to the farm, we relaxed by cranking open the windows and enjoying the view! After a sunny afternoon and some fresh air, she’s been towed back to the garage where she sits now, waiting for some TLC. We’ve taken lots of measurements, and we’re looking forward to spending the next few months accumulating parts and going up to work on her when we can. More photos to come as we get to work! We would like to sincerely thank Joe, the previous owner of the 1972 1400. He was a fantastic seller, and extremely reasonable when we discussed the work that we’d have to put into her to get her back into premium condition. He told us how much enjoyment his family had gotten out of the Shasta, and seemed pleased we were planning on restoring her. What’s more, after some problems we had with the electric towing connection on our truck, he even agreed to tow her for us to her new home! 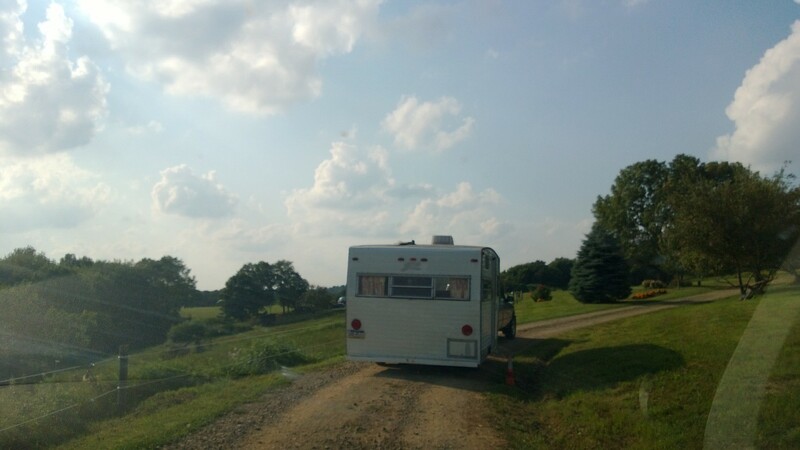 While we live in Pittsburgh, the Shasta is staying at our family farm up near Warren, Pennsylvania. We have a garage there where we can work on her – we can’t wait to start taking her apart and putting her back together again. Here are some shots of her interior, and one of her beautiful backside. As you can see, she retains much of her original 1972 charm. We’ve seen a few of these where the new owners gutted the interiors and ‘modernized’ them. For us, however, the appeal is in the vintage look. 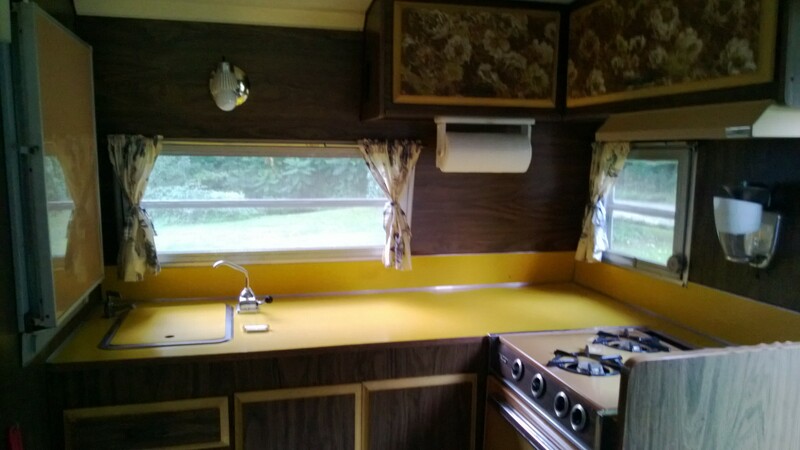 Check out those bright yellow counter tops! 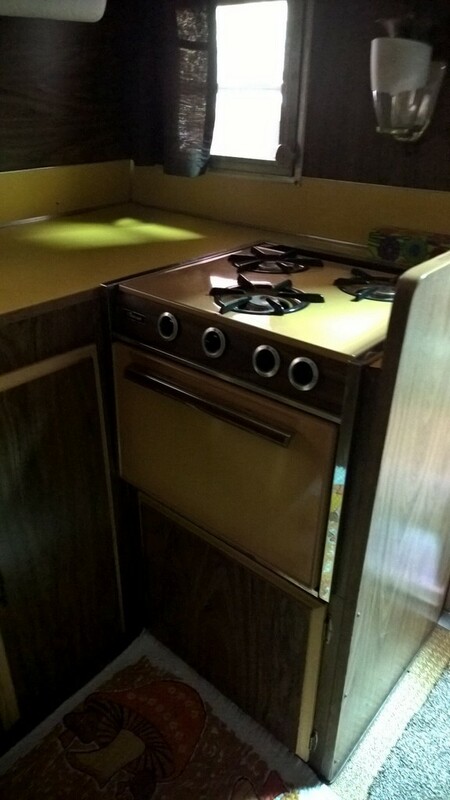 She has her original stove (a Trav’ler) and fridge, both in the classic tan finish, and nice dark wood paneling in pretty good shape. What you can’t see, though, is more problematic. At some time in her past she had some damage to the roof, which caused a slow leak that gradually rotted out her roof. The roof is soft to the touch from the inside, and looking up on the top of the roof you can see some obvious gaps where water is coming in. She looks great, but we will have to fully replace the ceiling and make sure there’s no water damage on the rest of the frame. Our challenge is to take her apart and put her back together again, with a modern solid frame and completely resealed, and get her looking as close to her original condition as we can! 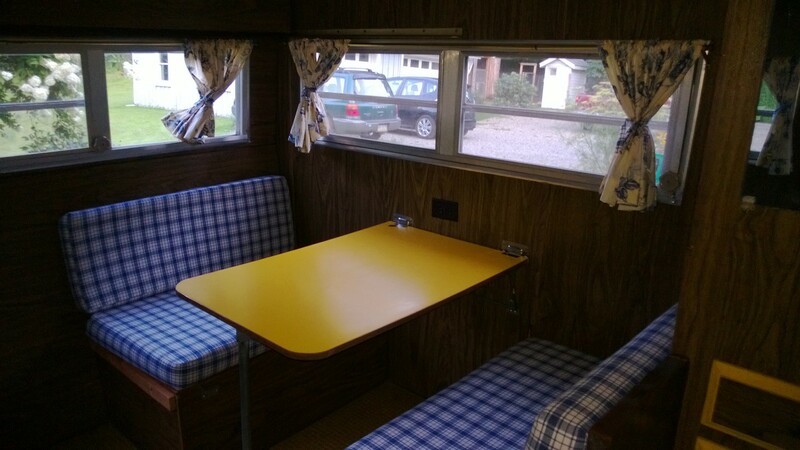 My husband and I have been looking for a vintage trailer to fix up, and we found her! 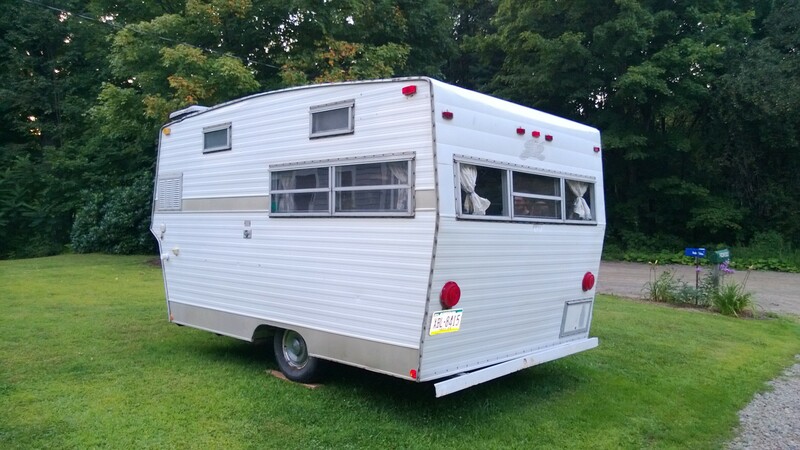 This pretty little 1972 Shasta 1400 was waiting for us in rural Pennsylvania. We are very excited about spending some time getting her back into her original condition, and happy to have finally found our project trailer!